Hi, Thank you, friends and viewers. 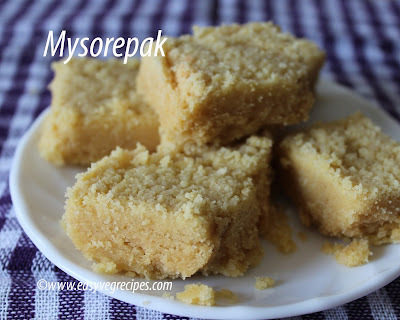 Today I will post how to make Mysore Pak recipe. Mysorepak is a South Indian sweet made with besan and sugar. After ladoo, Mysore Pak takes the second place in South Indian marriages. It is also kept available to distribute among guests of both sides, bride, and groom. Crunchy and easily melts sweet loved by one and all. It is not an easy dish to make a lot of tricks and tips have to be followed and we need to be alert while preparing this sweet. Gaining expertise in making this dish needs a lot of patience. Even I am also not expert in making it. I am writing it to keep a note of the ingredients and procedure. Every time I prepare this dish, I forget the ration between the ingredients. So this will also help me for my further preparation. It has a golden hour like a heart attack patients has for their lives to save. That is the most important time and it's only 15 seconds for it. Those 15 seconds are very crucial for Mysore Pak to get ready. We need to be alert during that time. If we take it off from the flame before that we get a burfi. If we keep it more than the required time it will turn into crumbles. So be careful while preparing this dish. I made it during Diwali festival time but posting it a little bit late. Mysore Pak -- sweet made with besan and sugar. Heat oil in a vessel, add this hot oil to the besan to avoid lumps forming. Keep ghee on the stove top and keep heating it for further use in another vessel. Heat Kadai or thick bottomed pan, add sugar and water. Let the sugar melt and boil till the bubbles form. Check the sugar syrup consistency, it should be one string consistency. Slowly add besan in portions while stirring continuously. Once all the besan mixes well with the sugar syrup, keep adding hot ghee to it. Add hot ghee spoon after spoon, while stirring continuously till the besan mixture should not stick to the kadai and let the ghee separates. Allow this to cook while stirring till the besan mixture cooks and get the texture of small beads. Immediately switch off the flame and transfer the mixture to a greased plate. Once settled cut into the desired shape and size pieces. Serve MysorePak hot or cold during festival season. Thank you for visiting my blog. Hope you liked all my recipes. Feedback and suggestions are welcomed. For more sweet recipes click here.